What I thought was just a postnasal drip just got diagnosed as possible asthma. As I may have a recurring health issue, I will now proceed to drown my sorrow in Tang Dynasty Tailored Ice Cream’s current flavor-on-demand, Soursop. Guyabano to the uninitiated. Siko Karabaw to the hoi polloi. Life is so cruel. So cruel. 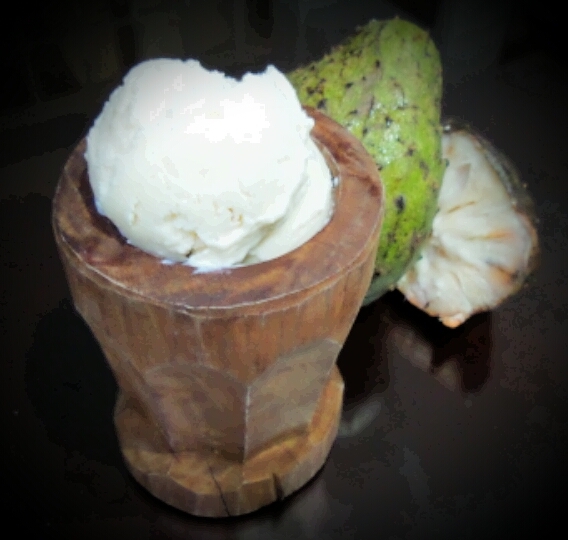 The soursop‘s flavour “has been described as a combination of strawberry and pineapple, with sour citrus flavor notes contrasting with an underlying creamy flavor reminiscent of coconut or banana.” (-Wiki). As its naturally creamy texture incorporates quite well with beverages and sweets, it is used to make drinks, candies and flavorings. Tang Dynasty Tailored Ice Cream’s take coats the taste buds with a full ice cream feel while retaining the citrusy tang of the fruit. Definitely no artificial colors and flavorings there. All natural sweetness with no added sugars. While the fruit is widely promoted as an alternative cancer treatment, there is, however, no scientific evidence of its efficacy. Hey, maybe it works for recurring asthma. I’m a willing guinea pig. Tang Dynasty Tailored Ice Creams is an upcoming bespoke creamery. They are currently in the product-development stage. Keep glued to pornografeed for updates on availability. This entry was posted in Uncategorized and tagged guyabano, Ice Cream, Siko Karabaw, Soursop, Tang Dynasty Tailored Ice Creams. Bookmark the permalink.